Election season is in full swing. 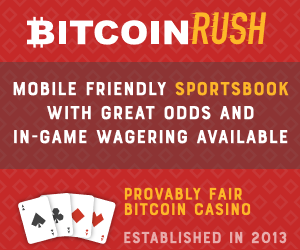 If you want a true reality check of how a lot of peoples hopes and dreams will be crushed with the harsh reality of the numbers then betting odds are the place to be. 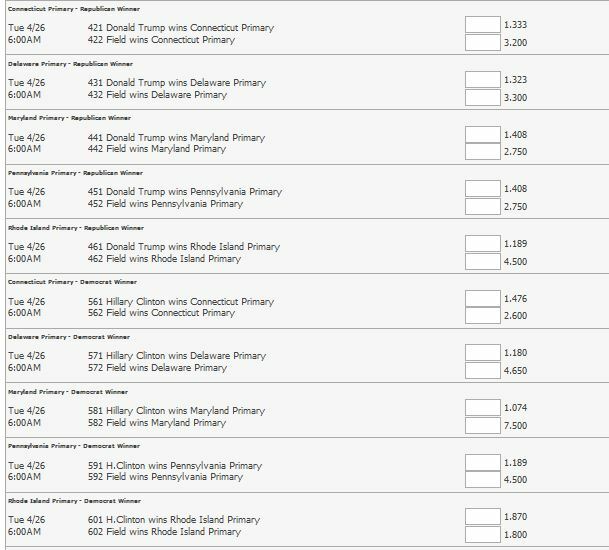 What is disapointing is that 5dimes does not allow parlay bets on these, you can add one of these bets in a parlay with other sports but not multi political bets in one parlay. On the Republican side looks like Connecticut is close but can Cruz win there? On the Democrat side Rhode Island looks like a coin toss. If Sanders campagins hard in RI then maybe it iw worth a bet at 1.800 that Clinton doesnt take that one. If you are a conspiracy theorist then here is your chance. Bet on Trump NOT getting the nomination at 3.10 or on Cruz getting it for 7.00. Your tinfoil hat will pay off seven fold if that hits. Here is a reality check for all the Sanders supporters, the books see no chance in hell that he gets the nomination.